Press Release: Former High School Dropouts Give Back By Holding Bar-B-Que for the Homeless…and Socks! Serving up Hot Dogs and…Sock! PHILADELPHIA, PA-May 12, 2011 ” What motivates out-of-school youth in Philadelphia to go back to school to earn a diploma? And what also motivates them to hold an end of semester service project where they are hosting a bar-b-que for the homeless? A group of students at YouthBuild Philadelphia Charter School feel that, regardless of their situation, there is always room to help the less fortunate. On Thursday, May 19, from 10:30 am to 1:00 pm at the Sullivan Building on N. Broad Street, 25 students will serve lunch to approximately 50 homeless residents from different shelters in the city. The students will also distribute socks, with goodies inside them as a special treat for the guests. For more information about this event, please contact Kristen Forbriger at YouthBuild Philadelphia Charter School at (610) 585-4819 or Tom Costello, Jr. from The Joy of Sox at 610-745-1075. YouthBuild Philadelphia Charter School is an innovative alternative education program offering a second chance for former high school dropouts, ages 18-21, to earn their high school diploma while learning vital job skills. The comprehensive curriculum at YouthBuild combines rigorous academics, vocational training, community service, and counseling to help students establish and achieve post-secondary education and career goals. 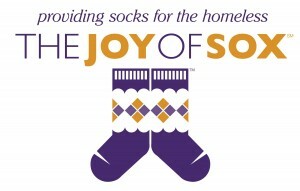 The Joy of Sox is a 501(c)(3) organization that has a simple mission: to provide socks for the homeless. They also strive to raise awareness of the plight of the homeless and the health problems that can be mitigated by something as basic as a pair of new socks.